Here, via frykitty, is a romantic tale for Valentine’s Day. 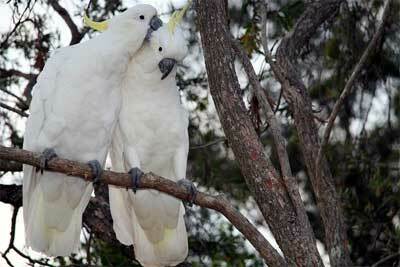 It’s the tale of two birds — two cockatoos — who fell madly in love. Naturally the new visitor becomes a mate. But I won’t spoil the story for you. Go read it yourself. But be sure to follow the “next page” links to get the whole thing. It’s charming. There are 1 reader responses to "A Tale of Two Cockies". The moment of your dad cockatoo burying the baby was tragic but also kind of telling, we don’t necessarily know what’s good for the animals and sometimes they’re the better judges of what they need and don’t need. Maybe there was something wrong with the baby that a person wouldn’t see, but which might impact the other cockatoos in the area, or even just their family. At first I thought it was just a way of camouflaging them. Anyhow, I’m very impressed by your love of the animals in your area and wish there were more people like you, the world would sure be a different place then :) Keep up the good work.